It was announced today that country music superstar Brad Paisley has added an April 6 tour date at Bridgestone Arena in Nashville. As part of the announcement Paisley unveiled a wall mural located on Level One of Bridgestone Arena. 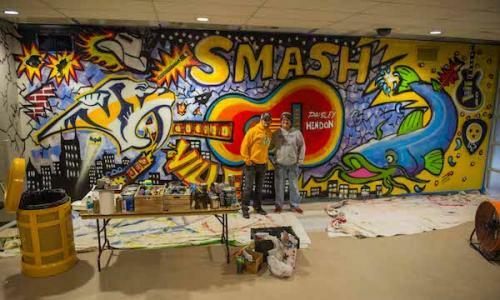 The mural was painted by Paisley and “the original guitar painter” Rob Hendon (robhendon.com). View a time lapse video of the wall painting HERE. The winter leg of the Weekend Warrior World Tour kicks-off this Thursday, January 25 in Los Angeles at STAPLES Center and extend through April. Special guests on the tour are Broken Bow Records Platinum-selling artist Dustin Lynch, RED BOW Records hit-maker Chase Bryant and fast-rising star and multi-instrumentalist Lindsay Ell. The 2018 Weekend Warrior World Tour is promoted by Concerts West/AEG Presents. Ticket on-sale information will be released soon.